Tomorrow in our adult Sunday School class, “Gospel Encounters,” we will continue our study of The Last Supper by reading Luke 22:7-38, watching the video from The Lumo Project based on these verses, and also watching and discussing the outstanding Bible Project video, “Sacrifice & Atonement.” Here are links to the slides we will use and these video resources. After reading this scripture together, we will watch this six minute depiction of the Last Supper with Jesus and his disciples, focusing specifically on what Jesus SAID and DID during this time. 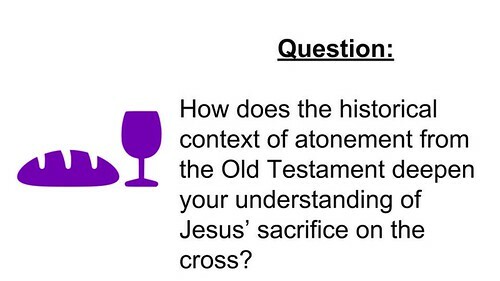 I plan to focus some of our discussion on both the Old Testament and New Testament contexts for “atonement,” and will show The Bible Project’s excellent six minute video, “Sacrifice and Atonement.” Note a freely downloadable version of this video is available on their project website, which does not include the request for project donations included in the YouTube version. If you live in Edmond, Oklahoma, or the Oklahoma City area and are able, please visit our church (First Presbyterian of Edmond) and consider attending our Sunday School class! You can check out past lessons as well as our upcoming schedule, continuing our focus on “Gospel Encounters” both historical and contemporary, by visiting pocketshare.speedofcreativity.org/ge/.